Last week I posted the roughs for this scene from The Last Viking Returns. 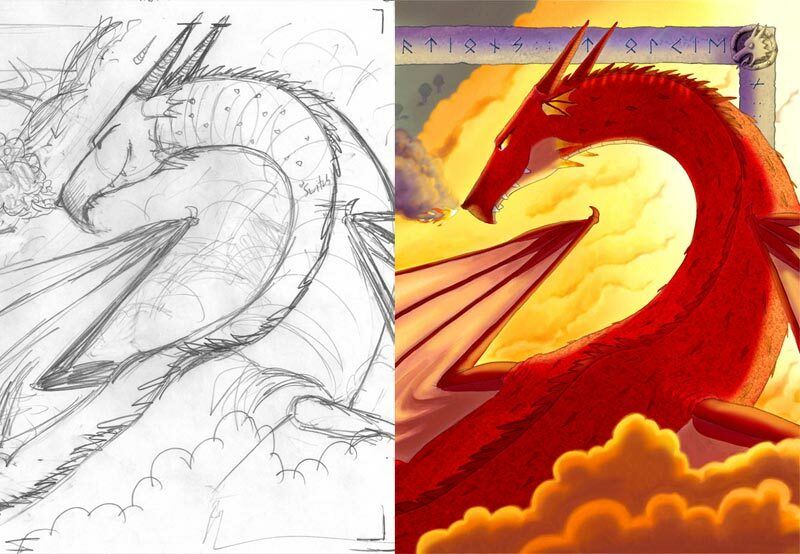 This post will show how I got from my almost-final rough to my final illustration. Categories: final artwork, illustration, roughs, The Last Viking 2 | Tags: Adobe Photoshop, corel painter, Fafnir, Odin, Painter, photoshop, The Last Viking Returns | Permalink. There’s a scene in The Last Viking Returns called ‘Big Trouble’ where Fafnir the dragon is finally revealed in all his terrible glory. The scene went through a lot of changes during development, so I thought I’d share them here. It’s a lot of pics though so I’ll share them in two parts. This post will show you the roughs, and next week’s post will show how the final illustration was put together. Categories: final artwork, illustration, roughs, The Last Viking 2 | Tags: cate sutherland, Fafnir, Norman Jorgensen, Odin, WIP, work in progress | Permalink. There’s only a fortnight until the release of The Last Viking Returns on Sept 1st! This is my last behind-the-scenes post before then. I’ve been focusing on one of the main settings in the book – a theme park called Viking World. There’s a moment early in the book where the family arrives at the park for the first time, and I wanted Josh to have a sense of awe. The text only says “Wow”, so I was free to fill in the rest. My first sketch looked like this. Not terribly impressive, not awe-inspiring at all, but it helped me to figure out what goes where. Categories: illustration, influences, Research, The Last Viking 2 | Tags: Fremantle Press, James Foley, Jurassic park, Norman Jorgensen, The Last Viking Returns, Viking World | Permalink. There’s only 3 (!) weeks until the release of The Last Viking Returns on September 1, and I’ve got a couple more behind-the-scenes things to show. I’ve been focusing on one of the main settings in the book – a theme park called Viking World. I had to figure out the rough layout of the park early on so that I could map the journey made by Pop, Josh and the family. I also wanted to make the backgrounds of each illustration consistent with the map so that the reader could really believe in the fictional setting. Categories: illustration, influences, Research, The Last Viking 2 | Tags: Fremantle Press, James Foley, Norman Jorgensen, Singapore, The Last Viking Returns, Universal Studios, Viking World | Permalink. There’s only 5 weeks until the release of The Last Viking Returns (Sept 1st), and each week until then I’ll show some more behind-the-scenes images. I’m focusing on one of the main settings in the book – a theme park called Viking World. The theme park has many places where patrons can buy food and souvenirs, just like a real theme park. Most of Viking World is in fact based on a real theme park – Universal Studios in Singapore. Norman and I attended conferences in Singapore in 2012 and 2013, and on both occasions we set aside a day to visit Universal (you can read more about our adventures here). All the shops and eateries tie back into the theme of the park, which is movies.You can buy t-shirts and soft toys and all that usual stuff, but you can also buy fresh popcorn, and Oscar statuettes, and movie costumes. So for our park – Viking World – all the shops, restaurants and stalls would need to relate back to Vikings. Surely it wouldn’t be hard to come up with some ideas? Categories: illustration, influences, Research, The Last Viking 2 | Tags: Fremantle Press, James Foley, Norman Jorgensen, Singapore, Statue of Liberty, The Last Viking Returns, Universal Studios, Viking World | Permalink.